The Birthday Festive Feasting Snack Tray will start the celebration with its delicious selection of gourmet sweets and treats! A natural seagrass basket arrives bursting with the following goodies: 6- oz. caramelized chocolate sea salt cashews, 4-oz. white chocolate-covered pretzels with rainbow sprinkles, 6-0z. orange creme almonds, 6-oz. chocolate covered fruit bowl mix, 6-oz. peanut brittle, 3 Ghirardelli Dark Chocolate Squares, 3 Ghirardelli Milk Chocolate Squares with Caramel filling, and 6-oz. Thatcher's Chocolate Drizzled Caramel Corn. 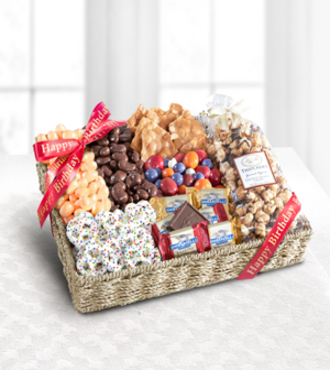 Tied with a Happy Birthday ribbon, this gourmet gift is a wonderful way to share in the happiness and fun of their special day.